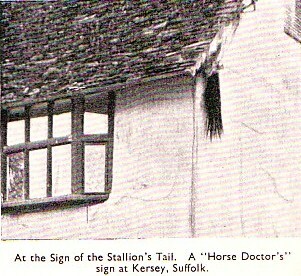 There is a photograph from 1956 in the National Archives which shows, it says, the farrier's trademark of a horse's tail on a house in Kersey. Don Lemon was the local horse doctor in Kersey during the 1940s - he had no veterinary qualifications, but his house was marked by a horse's tail, according to an article in The Independent, 23 January 1993 about the sale of some houses in Kersey. A more recent advertisement for a holiday cottage in the area mentions a fox's tail: whether the original is now so matted that's what it looks like, or whether the tail has been changed and no one now remembers what it ought to have been I do not yet know. 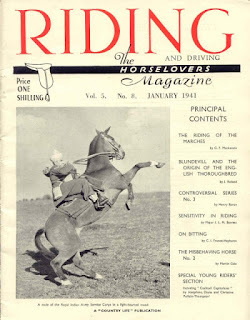 Didn't find anything about this in a brief look at a few horse books on the shelf, only more online about the same Dr. Lemon you mention: "The origins of Highcliff Veterinary Practice can be traced from the first half of the nineteenth century, from the Grimwade family of Farriers, Horse Doctors and Insurers. They lived and worked in Kersey, and as was traditional at this time, a horse's tail hung outside the house to enable clients to recognise the trade. This still remains today hanging from the eves of a house near the ford in the village. 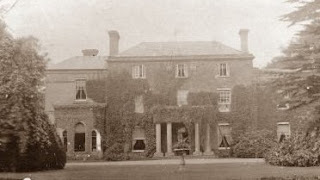 The practice moved to Hadleigh after the Second World War. Three generations of the Lemon family (George, Alfred and Donald), worked locally from 1870 until Donald retired in 1977." I wonder if the Kersey example was a very late survival, and the practice had died out elsewhere? I haven't yet found any mention in any of my books either. It must be older too. I had a quick look in Graves but he hasn't picked up on it (not necessarily exhaustive). I'm a bit puzzled by the reference to the whole thing as though it was very well known. It might be that there are no references because it was one of those things no one ever questioned. The reference to it being well known might be simple repetition of a mistake. I had a quick look at Gervase Markham's Markham's Masterpiece and can't see anything there (though I think it would only be a passing mention - Markham isn't really big on marketing).